David Weber is probably my favorite author as far as fiction is concerned, but I admit that I had put off starting his “Safehold” series for a while because I was afraid it’d ruin my perception of him–that is, as the author of the greatest military sci-fi I’ve read, the Honor Harrington series (see a discussion of one of the books here). Finally, I gave in and read it and just had to share my thoughts here. Let’s get it out of the way: this a phenomenal way to start a series. Humanity has been all but destroyed by the alien threat known as the Gbaba. The last vestiges of humanity have been brainwashed (voluntarily) into losing all memory of technology–the way that humans were discovered by the Gbaba–and were then established on a planet, Safehold, to try to start afresh. Some of the humans who went with them as these memory-altered humans were being sent to their planet, however, changed the programming to include an extremely powerful church hierarchy. Other humans want to stick with the game plan and have the last home of humanity be a place where they could regrow and develop technology planetside to avoid detection by the Gbaba. These factions clashed, and from the ashes came Merlin–the main character–a kind of human-robot whose goal is to guide humanity along the second path and away from the hierarchy established by others. And that’s where this book takes off. Weber does a masterful job interweaving elements of fantasy, political drama, and science fiction in what was one of the most exciting experiences I’ve had reading a book. He sets the table for a truly epic series–one I hope will develop towards an ultimate battle with the Gbaba. As is typical with Weber, lengthy conversations and insights into politicking are interspersed with battles–here they are battles on the high seas instead of in space. In-depth descriptions of new technology are also offered, but they add to the depth of the story rather than ever seeming dry. There are also a number of questions related to theology, philosophy, and politics that come up simply as aspects of the plot. This adds another layer of depth to a book already brimming with awesome. When I finished this book, I stood (I was rocking my sleeping baby in a front baby carrier) and smiled as I contemplated the breadth and depth of the new world that David Weber had just introduced to me. It was an amazing moment as I realized the true scope of the plot to which I had been introduced. I hope the rest of the series cashes in on this promise, and that we get a centuries-long epic. 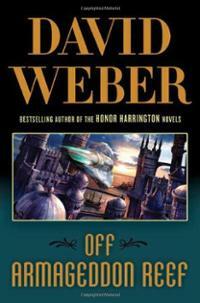 Off Armageddon Reef is an awesome beginning, and I can’t wait to read more of Weber’s Safehold series. I’m hoping it’s going to be a centuries-spanning epic that the introductory portion seemed to promise. They don’t make movie posters as epic as they used to. This is SWEET! I embarked on a quest to watch through Tor’s list of 80s Fantasy. I haven’t seen many of those flicks, so I figured I’d watch through. 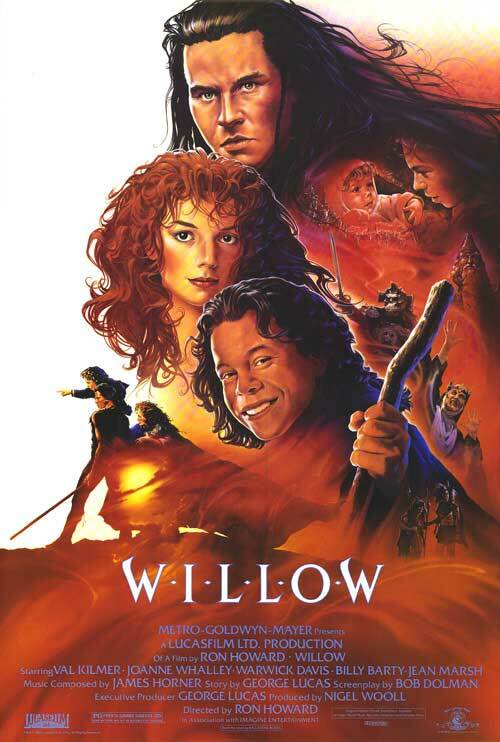 Here, I review “Willow,” another one that I had never seen before. There will be SPOILERS in what follows. “Willow” is the story of a prophecy- one that says that a dark Queen–Bavmorda–will be overthrown by a child. Naturally, the Queen decides to check for all the children to see if they might be the prophesied one, but also naturally, that one is born and many people manage to work together to smuggle her away. Then, she ends up with Willow, part of a Nelwyn–race of little people–community. After they decide to take the child elsewhere because she’s not their problem, Willow gets embroiled in an adventure to protect the child alongside Madmartigan, a great swordsman (and seeming ne’er-do-well). Along with some Brownies and other characters met along the way, they protect the babe and Willow–the aspiring Sorcerer–saves the day. Wait, what? I thought the kid was supposed to defeat the Queen! Well never mind that. And really, never mind basically any attempt to be serious about anything in this movie. After an opening that seemingly promised epic adventure, we are delivered a kind of silly, whimsical journey of Willow’s own discovery of himself as a hero. But you know what? You don’t care. The movie is just that fun. So many scenes stand out as just being uproariously ridiculous, like when Madmartigan and Willow go swooping through the snow, with Madmartigan ultimately getting turned into a solid block of snow. It’s silly, it involves sword fighting, and it’s amazing. Time and again the film delivers huge action scenes that are infused with all kinds of silliness, and as a viewer I really didn’t mind. It just works. Part of what makes it work is that a great decision was made to leave virtually no time for the viewer to sit back and reflect on the plot. It’s just action followed by more action followed by hilarity, all in a continuous cycle. Another part that makes it work is that it is so genuinely humorous. Only rarely do the attempts at humor fall flat. What does’t work so well is finding the audience. It’s clearly aimed at kids–Lucas himself apparently said so–but there is some pretty creepy stuff like the dark magic or some weird transforming trolls that are super gross. Also, there were clearly some scenes in which you as a viewer are supposed to be taking the movie more seriously… but you just can’t because of the context of the whole movie. It at times wants to be an epic fantasy, but it has sold itself so much on the comedy side that it can’t rebrand itself enough to be taken as seriously as it would like. What does work, though, is the underlying theme of the “little person” against the overall evil and injustice in the world. No that wasn’t supposed to be a pun! But it works! Anyway, it’s a good story of Willow finding in himself more than he thought was possible, and a story of how one person can change the world. “Willow” is one part epic adventure, one part a journey of self-discovery, and two parts silly. Whether that is a good thing or not is up to you. Silly and fun, “Willow” is an enjoyable adventure. Here, my wife and I offer a look at the best and worst parts of Season 4 of TNG! Feel free to chime in to let us know what you thought. There are SPOILERS for Season 4 in what follows. J.W. : Odan from “The Host“- seductive male with plot twist weirdness! We’ve seen this one a bunch of times already. Beth: Ardra in “Devil’s Due“- she was manipulative and evil. J.W. : All Cardassians. The introduction of this new race and culture in “The Wounded” is a huge step for the series and sets up so much drama later on. Beth: Picard’s sister-in-law from “Family“- she loves her husband and is committed to him and Picard being reunited as brothers. J.W. : Jean Luc Picard- Time and again it was Picard’s character who made an episode, saved the day, or delivered the emotional punch in this season. Data and Worf certainly had their moments, but not as many as the Captain. Beth: Jean Luc Picard- he displays a remarkable degree of versatility and acting skills in the range of things that happens to his character. J.W. : The ending of “The Mind’s Eye” when Geordi is forced to realize how manipulated he has been through a genuinely good counseling session with Troi. Beth: When Data deletes the program of his dating life in “In Theory“- it is such a remarkable moment to demonstrate how different he is from other people–he just deletes the program and his relationship ends. J.W. : The “big reveal” of Odan as a weird alien thing that just uses human bodies in “The Host.” How long have they enslaved this species? Beth: That Picard is escorting Wesley to go to the academy in “Final Mission“- weird that the captain would get sent to do that. J.W. : “The Host” – Been there, done that. Beth: “The Drumhead“- it didn’t really seem that plausible–suddenly, an Enterprise witch hunt; the end. J.W. : I debated this for a really long time with myself. “The Wounded” is epic and introduces an entirely new enemy in an awesome way. All Worf episodes were amazing. “The Mind’s Eye” has so many cool moments. 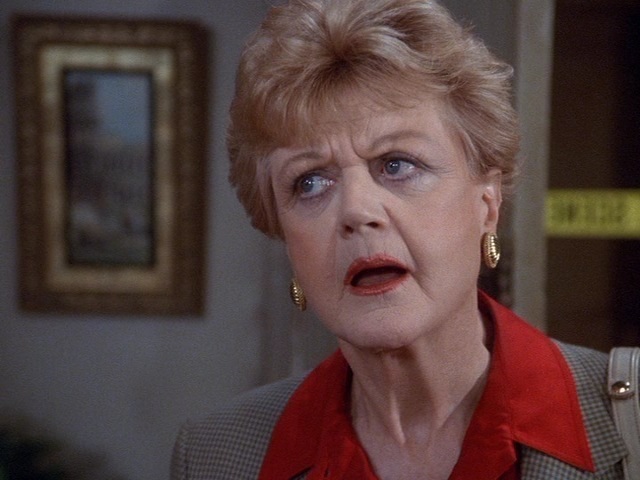 But ultimately, I have to go with what was the biggest surprise for me- “Family.” I didn’t like the episode when I was younger, but time and again I’ve thought about it since I re-watched it for this run through. It’s touching, it’s dramatic, and it’s so character driven. Amazing, amazing episode. Beth: “Qpid” – It was thoroughly delightful from beginning to end. Star Trek: The Next Generation Season 3 Awards– Don’t forget to also look at the Season 3 awards! 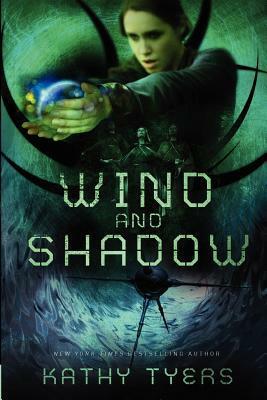 Wind and Shadow is the continuation of the Firebird series (see my review of the Trilogy here) and follows the story of Wind and her struggle to survive in a changing world. Wind is a descendant of the Shuhr, a people group that was a major threat to the stability and survival of humanity just thirty years before. She walks the line as a diplomat between the people of Mikuhr and the Federation which wants to make sure they never pose a threat again. Meanwhile, a plot is hatching to bring the Shuhr back into prominence and an evil Shadow has descended upon Kiel, a priest of the Sentinels–the people that the Shuhr have historically wanted to destroy. There are a few pacing issues in the story which are largely due to some lengthy portions with little action. This is a bit surprising given how action-packed the premise is. That’s not to say there is no action–it is there aplenty–but it just isn’t as interlaced through the plot as it perhaps could have been to keep it moving. The interplay between Wind and Kinnor Caldwell is interesting and Tyers once more does an excellent job potraying the difficulties of interacting among different faith backgrounds. Moreover, the worldview issues Tyers raises through Wind–such as loyalty to one’s own society, political intrigue, justification of genocide, and more–are of great interest. As in the previous books in the series, the world itself–Mikuhr–feels fully realized with good descriptions and background. It feels like a world and not just a backdrop. Wind and Shadow is a good sequel which isn’t quite as good as the Trilogy it follows. That said, its different tone and decided focus on worldview questions makes it a very worthy entry and interesting read. It doesn’t quite reach the dizzying heights of its predecessors, but Wind and Shadow is a worthy successor with much to commend it. Enter [Science] Fictional Messiah- “Wind and Shadow” and “Daystar” by Kathy Tyers– I reflect on a number of worldview issues that Tyers brings up in the concluding parts of the Firebird saga. *Sniff* – See you later, buddy! 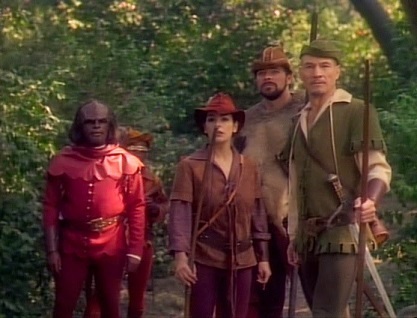 The crew of the Enterprise, and in particular Worf and Picard, are thrust directly into a potential civil war building up in the Klingon Empire. Gowron seeks to take his place as the head of the High Council, but the Duras family claims a newly found child should instead take the place of the Klingon leader. Meanwhile, Worf–prompted by Picard–seeks a way to clear his father’s name and restore his family’s honor. Gowron is reluctant to give Worf’s family their honor back for the little support Worf can offer, but ultimately, after Worf’s brother saves Gowron, does restore Worf’s honor. However, the split in the Klingon Empire–revealed to be prompted by the Romulans, remains wide. Watching TNG all in a row makes you much more cognizant of the continuous storylines that are threaded throughout. There are the stories of Data’s development towards humanity, Wesley’s growth, and Troi/Riker’s past, among others. 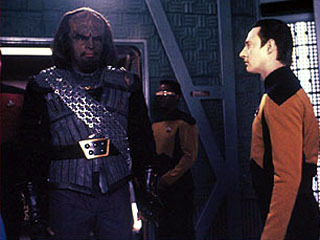 Worf’s Klingon background, however, is one of the hardest-hitting themes of the series. We have seen Worf enduring much hardship for the last season and a half or so, with his family’s name dishonored among all Klingons due to his decision to take the fall for the Duras family due to the political pressures building in the Klingon Empire. To have him finally seek to clear his father’s name is a wonderful premise for this episode to go along with the real tension of the possibility of a new Klingon-Romulan alliance. Gowron’s restoration of Worf’s honor was an awesome moment, finally clearing Worf’s family’s name. But even more epic was Worf resigning from the Federation after Picard chose to maintain a strict non-interference policy related to the Civil War. The final scene, in which Worf leaves the Enterprise with the whole crew honoring him on the way to the transporter room, seals the deal on this excellent episode. Also, let’s not forget the scene with Guinan schooling Worf in phaser tag. Okay, I accidentally managed to review an episode twice this season, so this single-episode review wraps up season 4! Next we’ll have the Season 4 awards post, and then dive into season 5! I have embarked on a quest to watch a number of 80s Fantasy flicks and share my findings with you, dear readers. Today, we reflect on Labyrinth. This is one of the many on the list that I had not seen before, so I’m coming at it fresh. The movie does many things right. The intro scene is just great, and the premise is a perfect set up for a childhood classic. It just feels like a perfect movie for kids to watch with the setup of Sarah having to watch the “annoying” younger child, Toby, along with her drifting into fantasyland, and more. It’s got 80s movie written all over it, but in a good way. The premise with Sarah having to make her way through a labyrinth to get Toby back is fun. Plus, David Bowie is a pretty awesome Goblin King. The sets were also pretty cool to see, and some of the costumes were really neat. Let’s just get this out of the way: you can’t unsee David Bowie’s pants. Every scene it’s like they decided to accentuate a certain masculine feature of the man by means of strangely fitting garments. One might even argue that his pants are the true antagonist of the movie. I’ll just leave it there. There are also some really inexplicable scenes, like the one with the weird fire thingies that throw their heads back and forth. It’s just weird, extremely long, and obnoxious. Other scenes also seem to be really drawn out to the extent that the movie seems to absolutely crawl at times. All that said, though, this is another 80s Fantasy Flick I wouldn’t mind seeing again. It has an undeniable charm and real sense of fun throughout that is absolutely necessary for a movie like this. 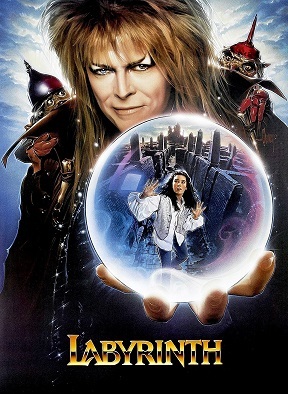 “Labyrinth” is a fun movie I wouldn’t mind seeing again, particularly with the ability to skip through some of the unnecessary scenes.